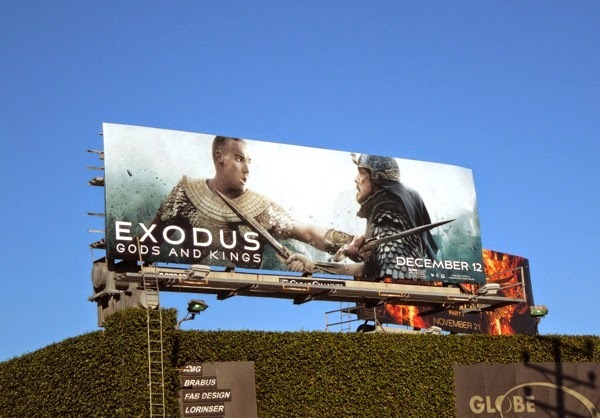 Ridley Scott is not the fist director to adapt the Exodus story from the Old Testament, as most of us remember Charlton Heston as a bearded 'Moses' in Cecil B. DeMile's 1956 classic, The Ten Commandments, but you know with the visionary filmmaker behind such iconic screen gems as Alien, Bladerunner and Gladiator, that this sand-and-sandals retelling is bound to be epic. 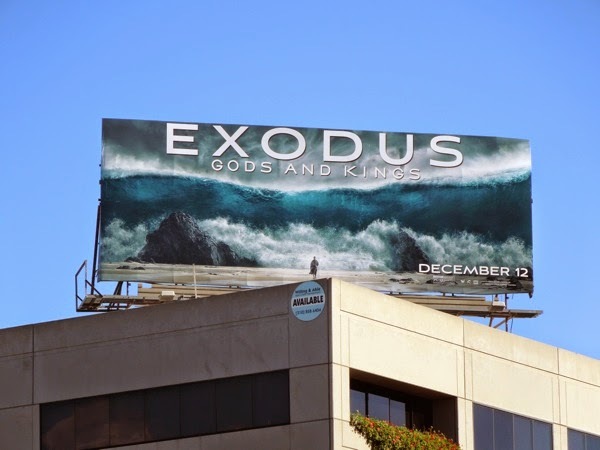 In fact, even though the Biblical film looks like it'll have the familiar miraculous parting of the Red Sea, it looks like this Moses, played by Christian Bale, is not afraid to get his hands dirty fighting for the freedom of the Israelite slaves from the Egyptian Pharaoh 'Ramesses II' (Joel Edgerton). 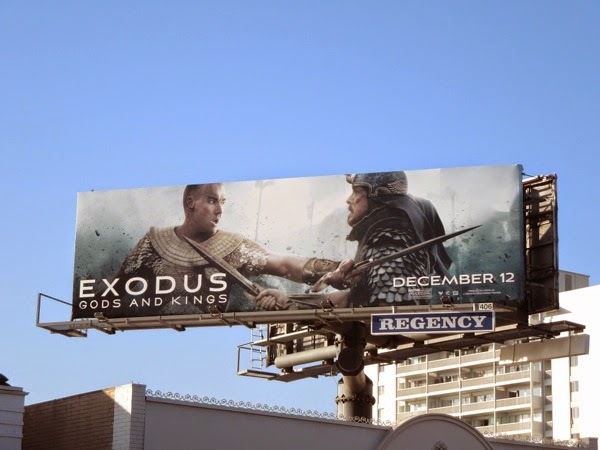 With modern day computer-generated special effects you know that Ten Plagues of Egypt will look more realistic and apocalyptic than ever before, and the sword and chariot fight scenes will be legendary, but will this motion picture adaptation appeal to, or offend religious audiences. 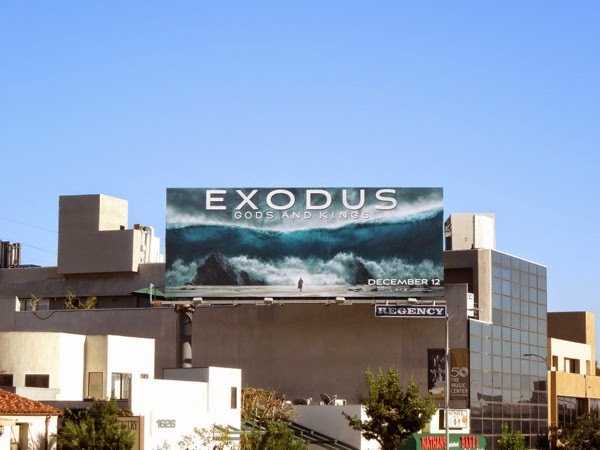 The Exodus billboard featuring a dueling Ramesses and Moses was first spied along Sunset Boulevard on November 20 and later along La Cienega Boulevard on November 26, whilst the impressive 'Red Sea' creative was spotted above San Vicente Boulevard and along Westwood Boulevard on November 21, 2014. If you're a fan of the movie, be sure to also check out these spectacular original costumes from Exodus: Gods and Kings worn by Joel Edgerton and Christian Bale on display, by Oscar-winning designer, Janty Yates. 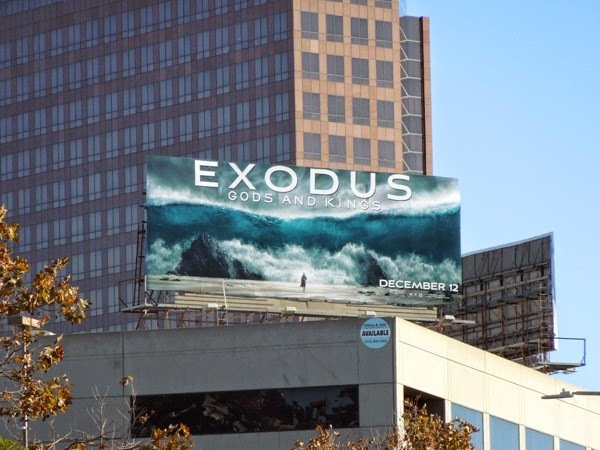 Plus if you like Biblical epics, be sure to also enjoy these movie billboards for Noah from earlier this Spring, which also featured some serious water effects in the form of the apocalyptic flood to end all floods. 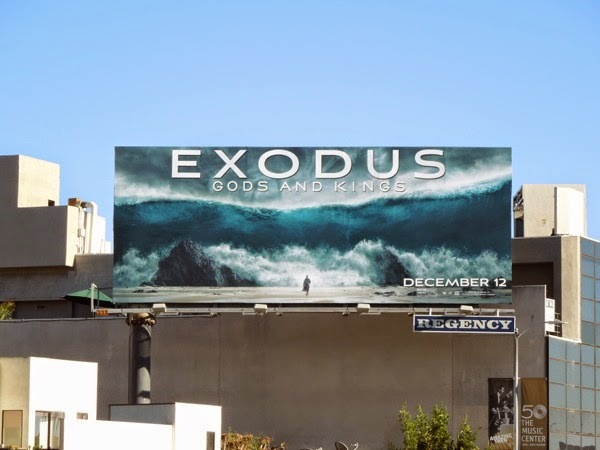 Can Ridley Scott's Exodus: Gods and Kings restore faith in the box office this holiday season, or will it be an epic failure?